According to the tour operator it takes two and a half hours to get from Corfu Town to San Stefanos. Well yes the way they do it does, by the time you get there you will have seen the best part of half the island and been to most of the resorts on route. If you take a minibus it takes an hour even going via Sidari because we decided to share. By taxi it can be even less although I have to say it can also be a bit hairy when the driver is in a hurry. This year the Holiday Companies have a new idea up there sleeve. They want to make the holidays in Greece fully inclusive or if the site is not able to cope at least bed and breakfast. Now looking back a few years this is exactly what they did in Spain when things got tough and what was the net outcome of that? Over a number of years the quality and the cleanliness of the hotels got worse and worse in the end you expected to stick to the carpet, be offered crap food and only be able to drink inferior booze, in other-words you expected rubbish. Spain has never totally recovered from the resultant mess and hangover reputation. In Greece times are hard tourism is for large parts of the country the only external source of income. The government has been forced to accept austerity measures and has put up taxes. Add to this tour operators that dominate the market, refuse to increase prices and demand more from there suppliers, the people you stay with! If you are to book with a tour operator please choose one that is not doing this to the Greek people, even better book directly at lease you then know what you are paying for your accommodation and who is getting the money, after all you give it to them! San Stefanos is a small village on north west Corfu; so what do you do once you get here apart from lie on the beach, swim in the pool, sleep, eat and drink? Well, two hours travelling takes in a number of islands, the Greek mainland, Albania and the whole of Corfu. A ferry even goes to Italy from Kerkera, Corfu twon. However, I will restrict my comments to Corfu itself as we have never yet felt the need to leave the island! 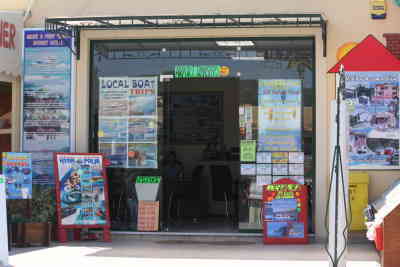 Here is the place to came change your money into euros or to book your days out, hire a car, motorbike, quad or a boat, book your flight to and from the UK or even book your wedding here in Greece. I'll say all that again in a moment but in reality Noola and her crew, many of them English, can arrange you holiday in all its detail. If years ago you could have booked it via your tour operator or travel agent now you can book it here and at prices that are well below those you pay in the UK. The cash machines, one just next door, now seem to be as reliable as those back in the UK. It is still not as easy as it should be to convert your money back and forth and the banks just seem to be determined to rip us of rather than provide a service. However, here on Corfu it is done with a smile and a friendly face so it does not seem do bad. Please remember the people you are talking to are doing the best they can and they don't work for the big multinationals who rule the roost! We don't often rent a car because we prefer to stay local. However, we often sit and watch Thanassis and the crew clean his cars, strange the way us Brits love to watch someone else work when we have time off! I have to say his cars are clean, well looked after and all based in San Stef. so, no hoping someone will bring it from somewhere else. Use the contact details on the web site to book a car before you leave the UK. Everybody at Tsaros speaks English so no problems with communications. Pegasus Bikes has a large collection of two and four wheeled machines. Here you can hire almost anything short of a car or a jeep. So scooters, quads, buggies, bicycles of all types and sizes. Hires are from half a day upwards and so you can have their machines for a full fortnight. If it breaks down you just ring up and Nicos or one of his mechanics come out to fix the machine, it couldn't be easier. The laws in Greece are the same as the UK so crash helmets and driving licences are required so when you hire please ensure the helmet fits and wear it, you life might depend upon it fitting correctly. Before you leave the hire site check the machine is working, particularly the brakes, we have never had any trouble but just be sure. Please also be note, in recent months, the Police have been enforcing the law far more rigorously and the fine is €80 so, do it, wear the helmet. Lecture over, once you have wheels go have lots of fun and explore. Want some ideas then go and have a look at our places to go page. 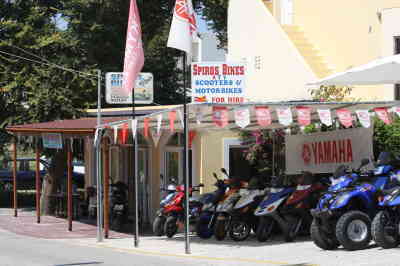 Spiros Bikes has a large collection of two and four wheeled contraptions. 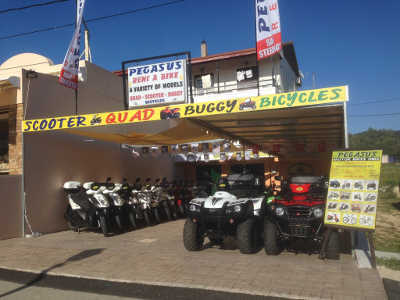 Here you can hire your dune buggy, motor bike, scooter or if like us you prefer four wheels your quad. Don't be scared if you have never ridden a bike these machines are very simple to drive, an accelerator and two brakes is about as complicated as it gets so if you can ride a push bike you are over qualified. If you have never ridden a bike the trick is simple, get four wheels and take your time! Hires are from half a day upwards and so have their machines for a full fortnight. If it breaks down you just ring up and he comes out to fix the machine, it couldn't be easier. The laws are the same in Greece crash helmets and driving licences are required so when you hire please ensure the helmet fits and wear it, you life might depend upon it fitting correctly. Before you leave the hire site check the machine is working, particularly the brakes, we have never had any trouble but just be sure. Lecture over, once you have wheels go lots of fun and explore. Want some ideas then go and have a look at our places to go page. This is another favourite; I get great pleasure from walking the beaches, through the olive groves and over the ridge to Arillas. It is advisable to take a bottle of water, a hat and a mobile phone if going off the beaten track (although signal is sometimes a little hit and miss!). 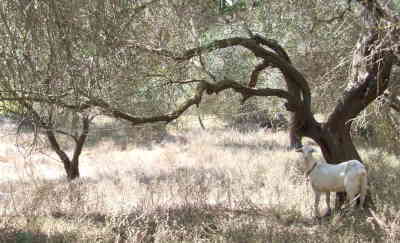 Please also watch where you walk as Greek fields and crops are not always obvious. One of the simples walks takes you along the road north towards Avliotes a walk of a couple of miles. Most of the time once you leave San Stefanos you are walking in the shade of trees. Some care is needed because the road is fairly busy but not by british standards. From the road you get views to the sea, through Olive groves and when you get to the village; the church, the village square and many old houses on the back lanes of the town, well worth it!. The Yellow Boat Company and San Stefanos Boat Hire offer boats for hire that take up to eight people for a day of fun in the sun. The coast of north west Corfu is very varied with everything from sandy beaches to very high rock cliffs within a couple of hours cruising of our little harbour. 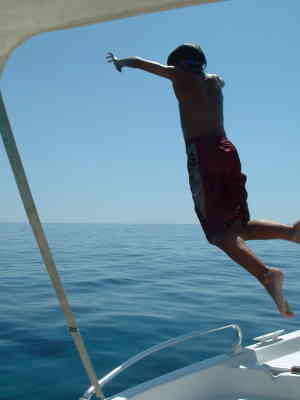 Swimming in the cool dark open sea from a small boat is great on a hot sunny day as long as you are careful. Cruise along the coast for a couple of hours, find a little beach under a cliff or a quiet rocky cove and have a swim and a picnic. Afterwards take a very leisurely drift back to home. What a way to spend a day. We have now spent a number of days pottering along the coast in a boat and we have never been disappointed. On one memorable occasion we pottered down to Palaiokastrisa and went scuba diving in a tiny little bay with a great number of fish to watch for hours. And yes he did land on his belly!